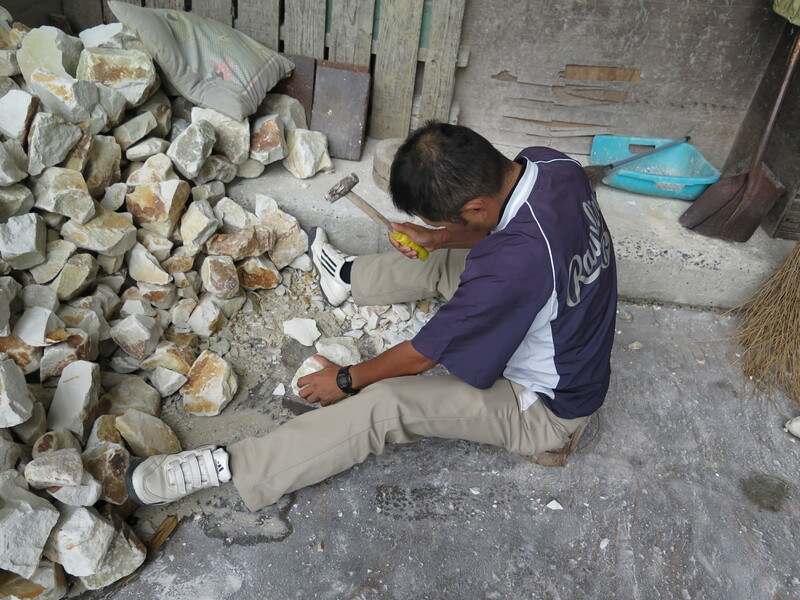 Today I go to visit another of the local porcelain stone clay makers. 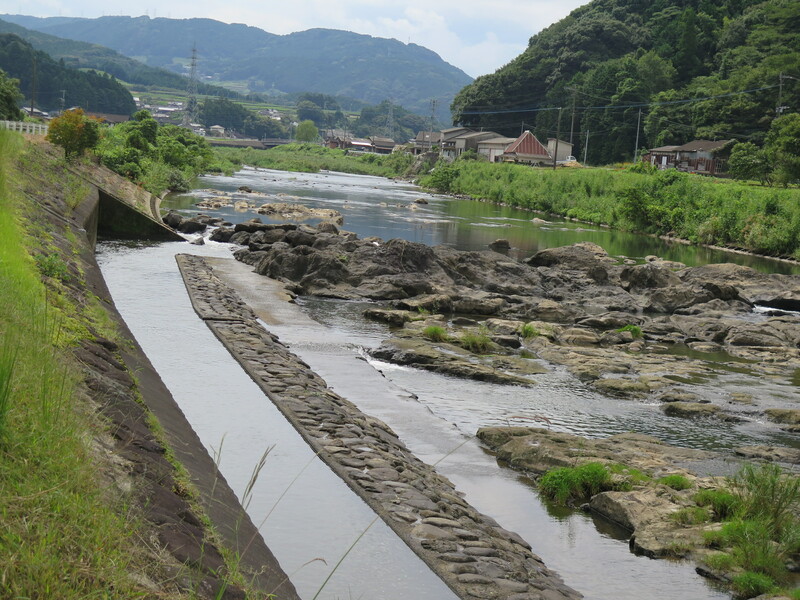 It is the 3rd of the 4 that I know off and the largest of the Amakusa stone processing factories in the area. So I’m re-visiting a lot of concepts that I am already familiar with, but it doesn’t hurt to reinforce what I think that I know and take a different perspective on it. This clay factory, I call it a factory, because that is just what it is, It’s huge, is owned by Mr. Coda. So it’s only fitting to reprise my clay making experience with a recapitulation with Coda! The port in the distance , down river. Coda san’s factory is out of town, quite a long way out-of-town, almost to the coast. In fact the reason that it is located here, by this river, so close to the port, is for two reasons. 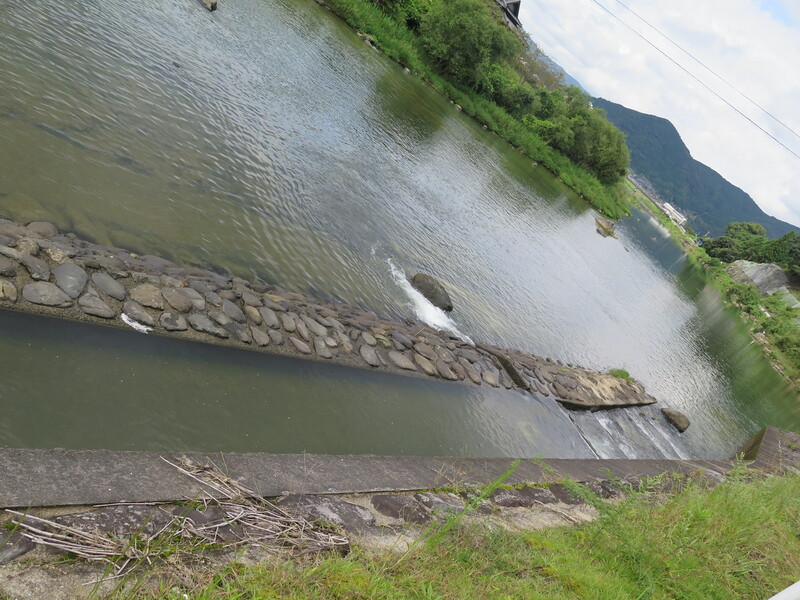 The river provided all the energy to power the stone crushing and stamping mills in the early days. 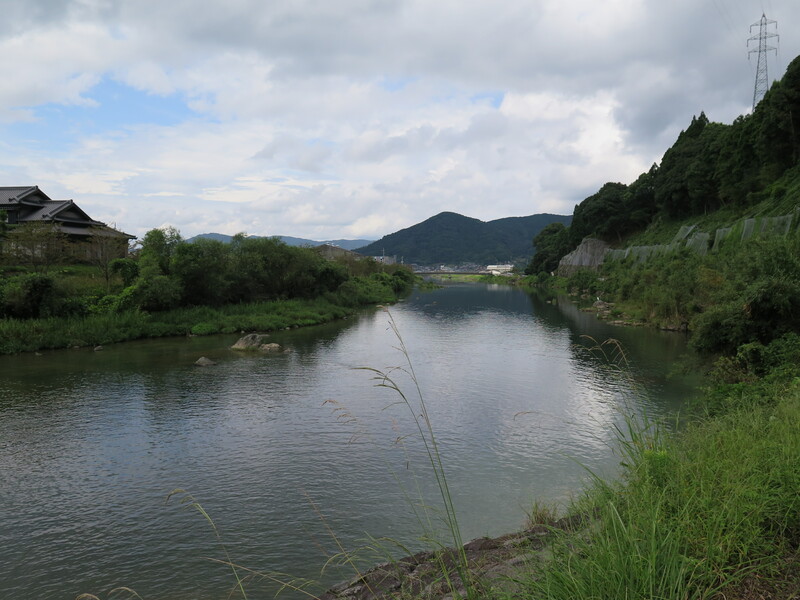 But the other important reason is that the Amakusa stone quarry is located on an island to the south of here and in the past, the only way to get the rock to the main island was by boat. These days there is a bridge and a ferry. But back in the day, it was all done by boat. So the larger boat would come to the port and the porcelain stone cargo was off-loaded to smaller craft and floated up here at high tide, so this location proved to be crucial. The remnants of the levy, leat and water slouches still remain in the river, although substantially rebuilt after some devastating floods that raised the river level to 3 metres above the roadway and half way up the walls of the factory buildings. 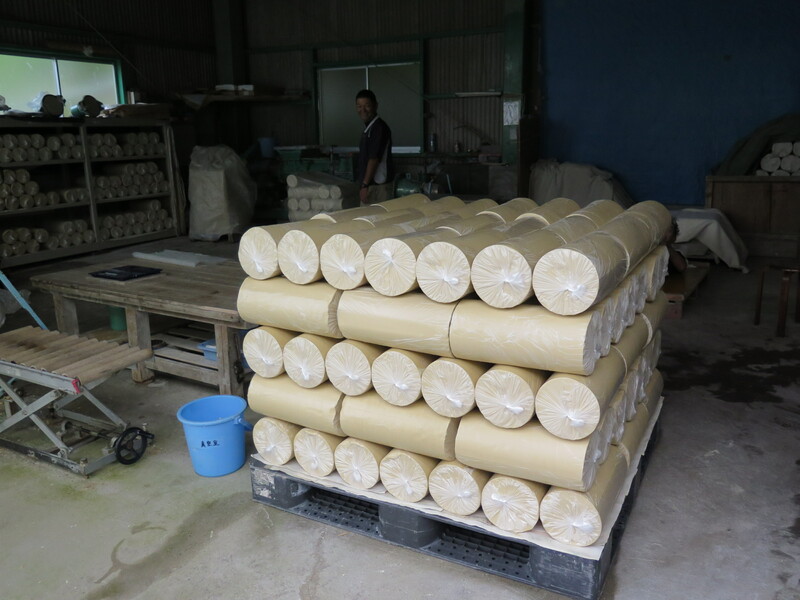 As this is the largest of the processors, there is a very large holding area where the new shipments of porcelain stone are sorted and stock-piled on delivery. 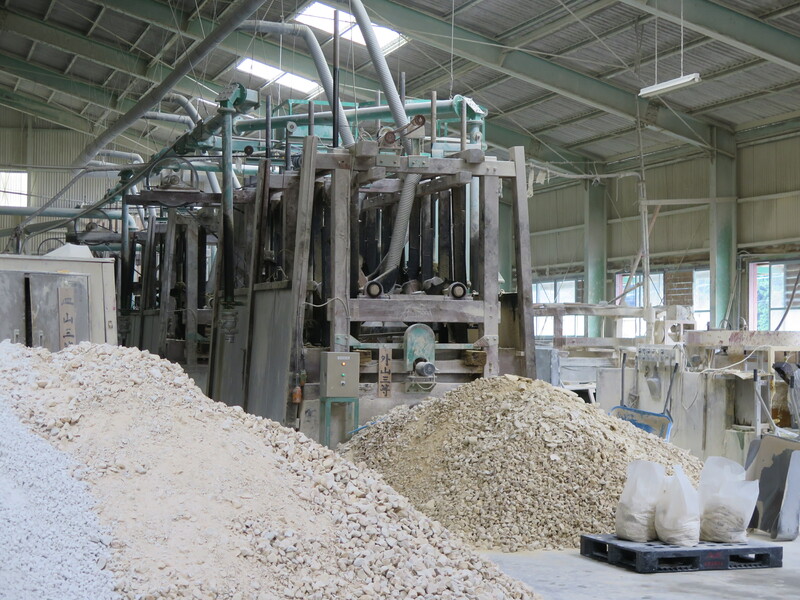 The factory receives about 100 tonnes of stone per month on a regular basis. This averages about one 10 tonne truck load every 3 days. They hold about 800 tonnes of stone in total, in stock here. This is because the deliveries of the stone are all varied. 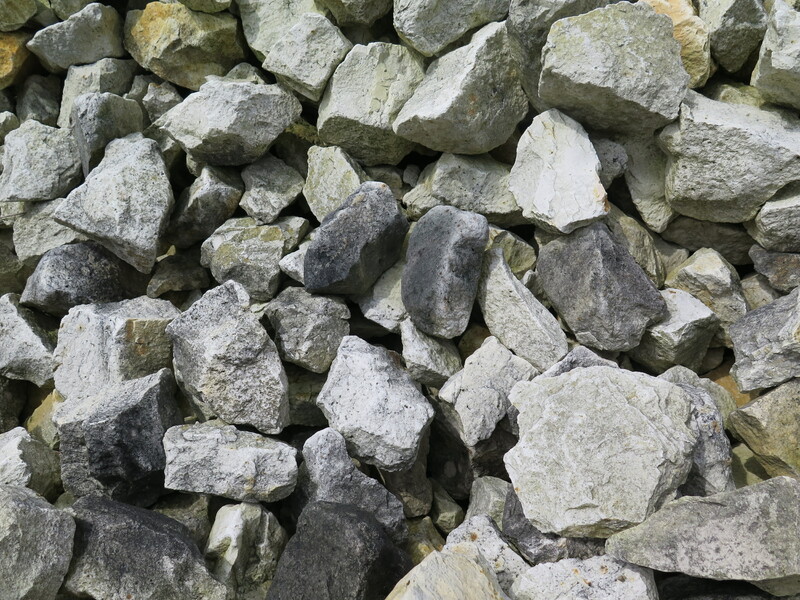 The deposit, as it is being mined, produces different variations of the stone at different times, so over the year, the material seems to come in differing grades at different times. 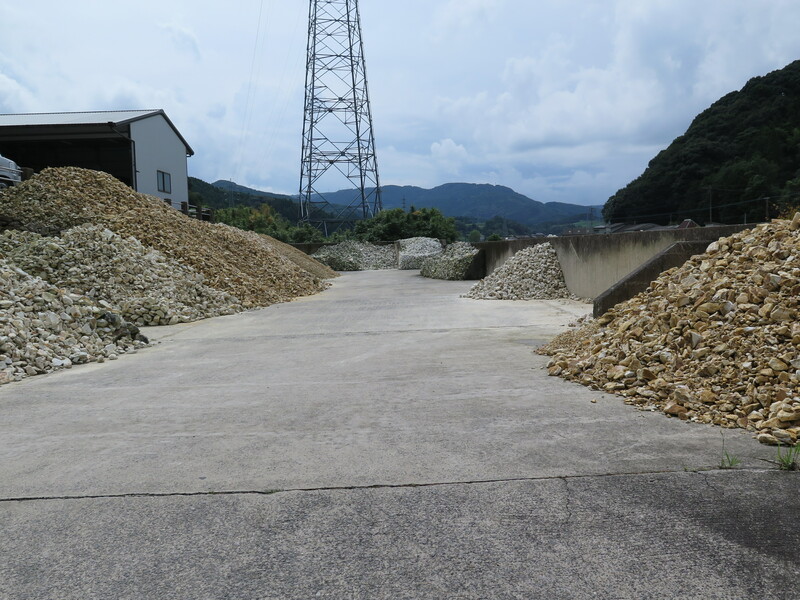 The quarry at Amakusa has horizontal strata of weathering, but the mining is done to some extent vertically down the face, for technical reasons to do with stability and safety in quarrying. The whitest and most desirable material is close to the bottom, so a lot of other iron-stained material has to be removed first. For these reasons, it has proved to be necessary to hold a lot of stock to make sure that there will always be sufficient of any one variety, or variation of the material to fill specific orders. I think I understood Coda san was telling me that the quarry also closes during the hottest months of the summer? Meaning that sufficient stock has to be held to get the factory through the lean times. 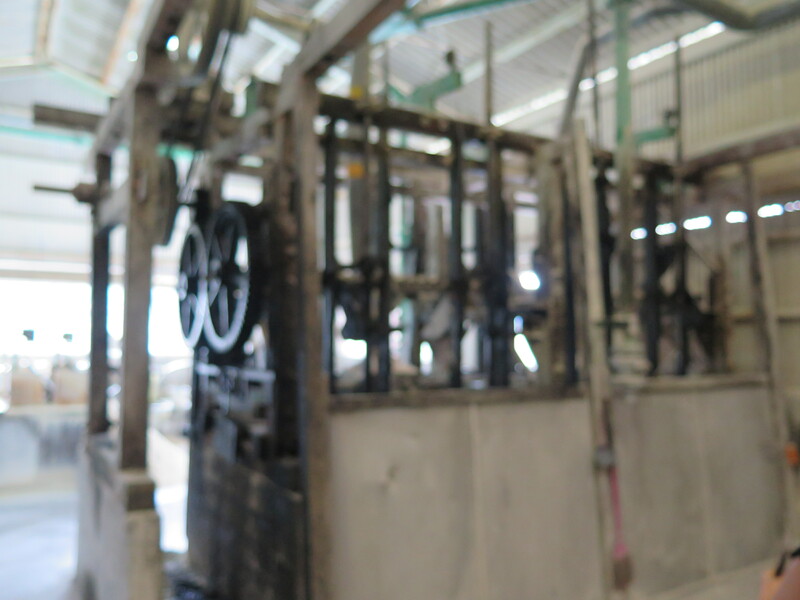 During our tour, it evolves that this factory supplies clay to Malcolm Greenwood and Simon Reece in Australia. A friend has done all the paper work and organising of the complex, import regulation form filling. So far there have been 3 or 4 orders for 3 tonne lots in the past two years. So that is very interesting. I didn’t know that. I’ve come all this way to find out that my friends are customers here too. For some special customers the whitest stones are still hand chipped to remove the iron staining from the fissure surfaces. This was once common, but these days it is hardly ever done due to the high cost of hand labour. Coda san gives me a demo, but reiterates that he is glad that this type of processing is in the past. 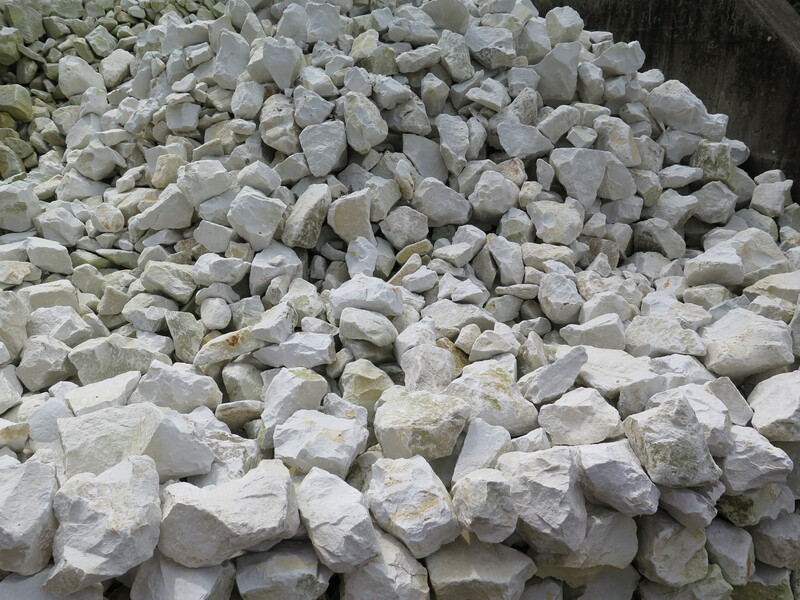 They carry such a huge stock of stone to choose from, that these days they simply choose from the whitest material as it comes to them. The first thing that you notice as you approach the factory, is the music of the double quick-time rhythm of the stamp mills. 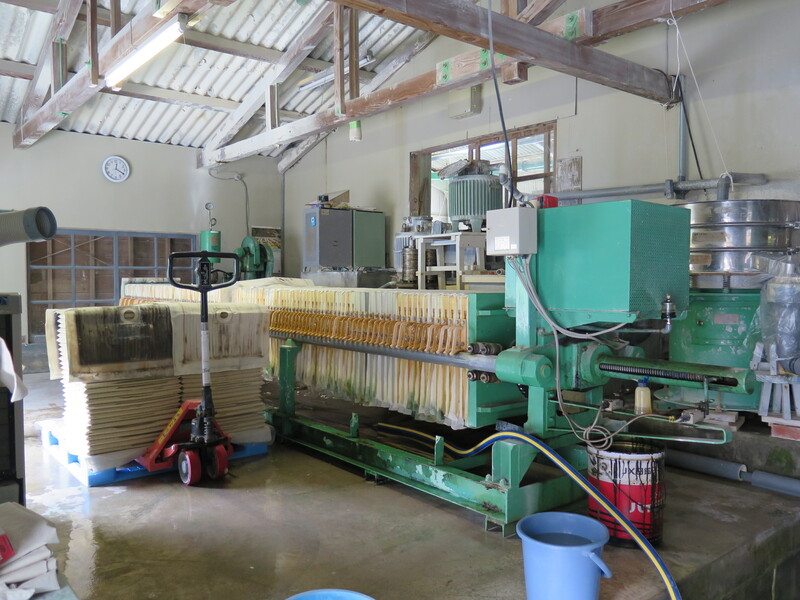 These mills run 9 to 10 hrs per day, and there are several batteries of them. All still made of wood, not because they are old, but because the wooden structures have two essential benefits over steel. The first is that they don’t rust and drop iron particles into the stone powder as it is being worked. The other is that wood takes the percussive stresses of the intensive, pounding rhythms that fatigues metal structures. 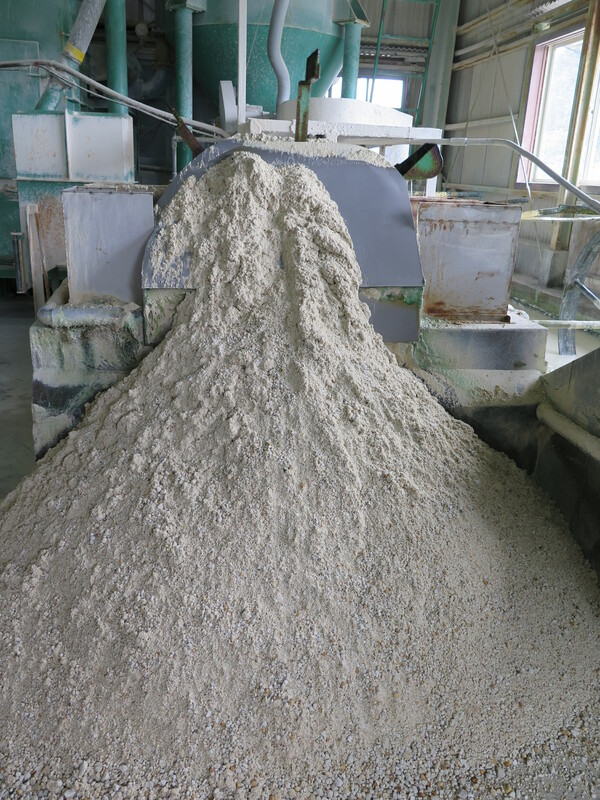 Once the stone is reduced to powder in the stamp mills, it is transferred to the wet processing area where it is blunged and levigated to remove the excess silica. This is done in a two stage process. Spring water is used in the factory, as they have a beautiful garden just behind the factory buildings and what appears to be a decorative pond, but is actually the water supply for the processing. 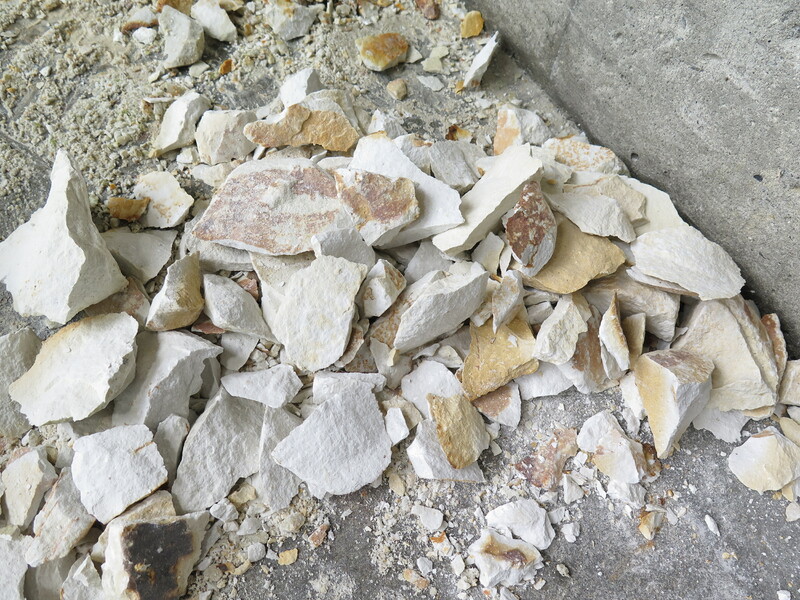 Once all the fine silica is sedimented out of the slip, it passes through two sets of electromagnets to remove any stray bit of magnetic iron, such as pieces that have worn off the machinery during processing. Magnets can only remove metallic iron particles. 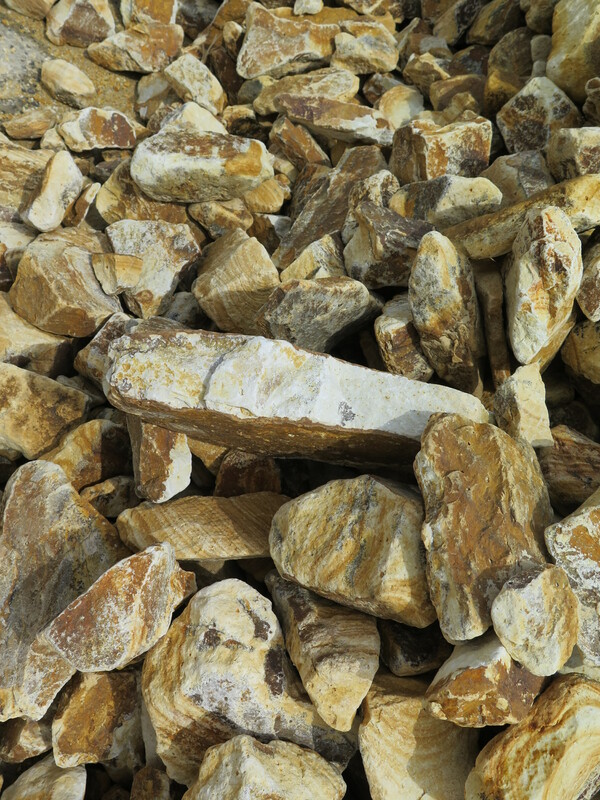 The yellow iron staining that is naturally present in the stone, as it comes from the quarry is in the form of iron oxide and hydrated iron oxide. These minerals cannot be removed by magnets. The slip is then transferred to the filter press area to be de-watered and finally vacuum pugged and bagged ready for delivery. There are 4 separate production lines for the basic yellow iron-stained, medium creamy-white and special high quality white products, plus yellow-stained clay for slip casting that doesn’t have to be so fine and plastic. It’s quite an extensive operation and very well organised. Very modern and very efficient for such an ancient process. Very impressive indeed. After this very musical, further development and recapitulation of the clay making theme. I pick up my stave and walk to the bars before 4 time! I’m very impressed with the modernity and efficiency of this slick operation, but there is a part of me that identifies with the romantic idyl of the small rural clay making business of the humble Fuchino family. Having tried clay from all three of the clay makers that I have written about. I rather prefer the idea of rustic, hand-made clay of the Fuchinos. When I grow up, I want to be like the Fuchinos. 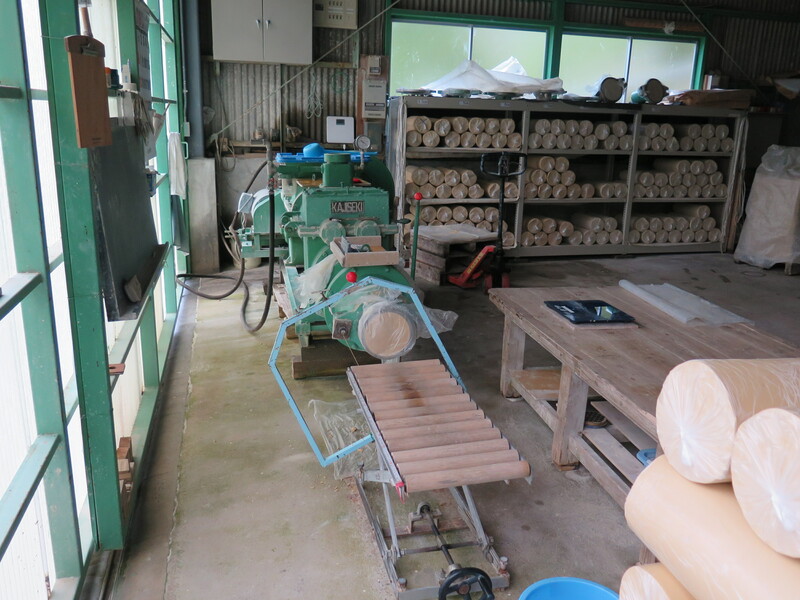 This entry was posted in arita, clay making, Japan, travel by hotnsticky. Bookmark the permalink.